The Wangen Type KL-R Pump can address your needs for feeding in solid material in the rigorous operation of a biogas plant. 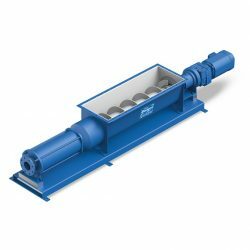 With WANGEN BIO-MIX pumps, solid materials are conveyed into the pump via the jaw hopper and mixed there with liquid from fermenters, after-fermenters or liquid manure tanks. Only then is the mix transferred to the fermenter. Optimum mixing in of even difficult solid materials, e.g. grass silage and solid manure. WANGEN BIO-MIX pumps prove that we combine experience with a readiness to create application-specific production innovations. Our aim is the trouble-free operation of biogas plants.